Follow Fridays are still all the rage. I feel like they took a little breather a couple months ago but are now back in full force. What is a Follow Friday? Another version of this is #mcm or #momcrushmonday and #wcw or #womancrushwednesday and the like. Never done one and want to jump in? 2. Figure out 2, 3, or 4 people that you’d like to do a Follow Friday with. These will preferably be people that you’ve had engagement with, at least recently. They don’t have to be very similar in style to you, but sometimes that’s a plus. Maybe go through a few of their pictures and see who’s engaging with their pictures too. See any accounts that you also enjoy and engage with too? You’ll want to find some overlap, since it’s a bit odd to have a Follow Friday with people you don’t even follow. Following me, here? Another good rule of thumb is to change the name of your direct message group to “Follow Friday (DATE)” so that it’s easy for everyone to keep track and see the messages more clearly. On a GROUP direct message in Instagram, you’ll click on the little “i” in the upper right corner of your main messages screen. Here, you’ll be able to rename the group messages. Also handy here is the ability to mute messages if you don’t want to receive notifications of them and Leave Conversation if you don’t want to receive any more messages. Since the other group members will see that you’ve left the conversation, if you don’t want that (they’ll feel all rejected) simply mute the conversation and you’ll still be a part of the group. Now, hopefully the people you’ve reached out to are amenable to doing a FF with you. If they’re not, it’s ok. Really, it’s ok. Maybe it’s them – maybe they’ve got a full Follow Friday calendar packed for months of people wanting to do a FF with them. Maybe it’s not the wisest to reach out to Meg Loeks for a FF when you’re starting out with 120 followers and your pictures are just, well, “ok.” That’s not a bad thing, we all start somewhere, we all have to learn exposure, white balance, composition, how not to over-edit a picture, etc. Try to choose FF members that have about the same kinda number of followers as you and are on about the same level as you, skill/talent-wise. Don’t take it personally, just know that you’ve got room to grow. It also appears kinda weird to reach out to a huge account for a Follow Friday when you don’t have many followers – it looks like you’re just using them to try to gain followers and that’s not cool. But also maybe consider it IS YOU…. And not necessarily your lack of followers or lack of skill. Maybe it’s how you come across on social media. Now – I’m a big big advocate in being YOU. Own it. Be Yourself. If you like to drop the F bomb like it’s hot, then do that. Rock it. But just know that maybe your desired FF friend has some deeply held beliefs against using language like that, at least publicly. You’re asking someone to ask their sacred followers to follow you. Don’t take that lightly. If you tend to come across as a jerk, don’t be surprised when people have full FF calendars and can’t do a FF with you, “at this time…” Take a look at your account, not just your picture quality, but also how people feel interacting with you. Are you uplifting and encouraging? Do you start drama or are overly critical? Do you post things that might be considered offensive to some people? Just think about it, that’s all. On the whole, our community of momtogs IS AMAZING. These are all ladies I’d love to be friends IRL with. But there’s a couple odd birds out there too. Maybe that’s you. And again, that’s ok. Own it. But just find your tribe, your people, and don’t expect for you to be everyone’s cup of tea. Good? Ok – so you’ve found your little tribe of Follow Friday Friends. You’ve decided on the date. Now what? 4. 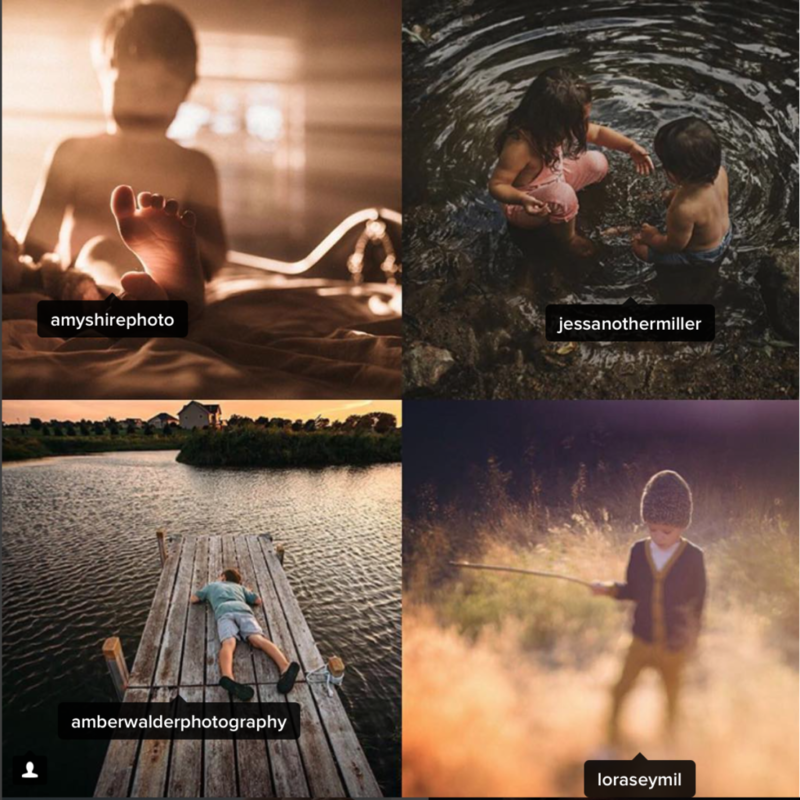 Peruse each of the four accounts’ pictures and find one of each photographer’s that would coordinate well together in a grid. You can choose all black and white, all sunflare images, all minimalistic images, all similarly colored or using coordinating colors, etc. For inspiration, take a look at some Hubs that use grid collages for their features, such as @NothingIsOrdinary, @Hiyapapayaphotoaday, @Shared_Joy, @LifeWellCaptured, etc. Get a sense of what makes a good grid collage. Also think about composition when cropping and placing your images in a collage. Is there an element in the image coming in from the bottom? Placing that image in the top half of the grid will look weird. Is there an element coming in from one side? Place the image in the grid in a position where it makes sense. Also be sure not to crop any limbs at poor places. Your sweet FF friend will see your grid and cringe (or scream) when they see how awfully you’ve chosen to crop the image. Just don’t be married to one image. If it’s not working, choose another one. 5. I use an Instagram app called Layout to create my collages. There used to be a good one called Follow Friday, but it didn’t make the cut the last time Insta changed it API. But Layout is from the Insta-folks and so it’s easy to use and that’s what I’d recommend. 7. 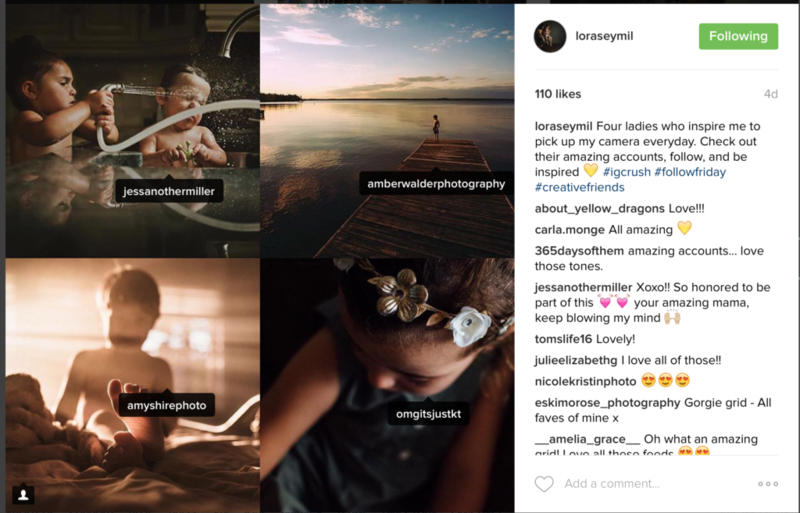 Tag the photographer in the actual grid post, on their picture, so that your followers know who took which photo. A tag is clickable and will take that follower to their gallery if they’d like to follow that photographer. I think that’s all… Definitely be on the lookout to use Follow Fridays creatively, especially if you’re a pro photographer for your local area. 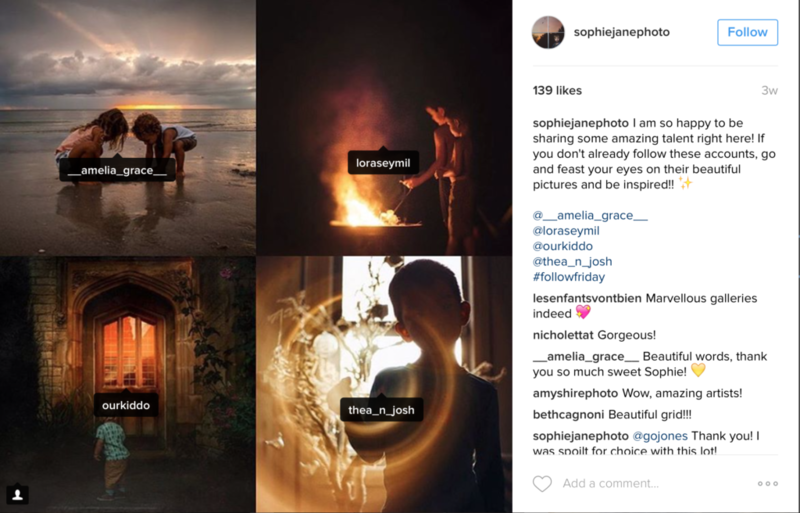 More and more businesses are on Instagram and perhaps reach out to do a local area FF. I did one once where I was a part of a group of small business owners in my immediate area. Think about what you have in common with some other accounts and roll with that. 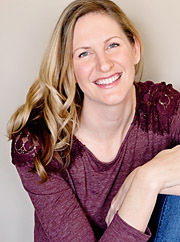 Is there a group of y’all doing a Clickinmoms workshop or breakout in the next few months? Do a FF with each other, describing what the classes entail. Do you specialize in beach sessions? Who else does? Are you offering Fall Family sessions coming up? Who else is and y’all could feature each other. Get creative! Lastly, don’t forget to keep the conversation going… Be sure to like and comment on each of your FF friends’ posts, and thank them for including you. Remember, the Insta-algorithm loves engagement. If you want your FF posts to be seen by more people, you’ve got to engage with it. Ok – remember I said I had a quick story for you? Well, I had never done a FF before (this past May) and was wondering when it’d be my turn to get picked for the team… One day, I got a DM from a fellow photographer, a group message, asking about doing a FF. I was elated! I replied back that I was all in. 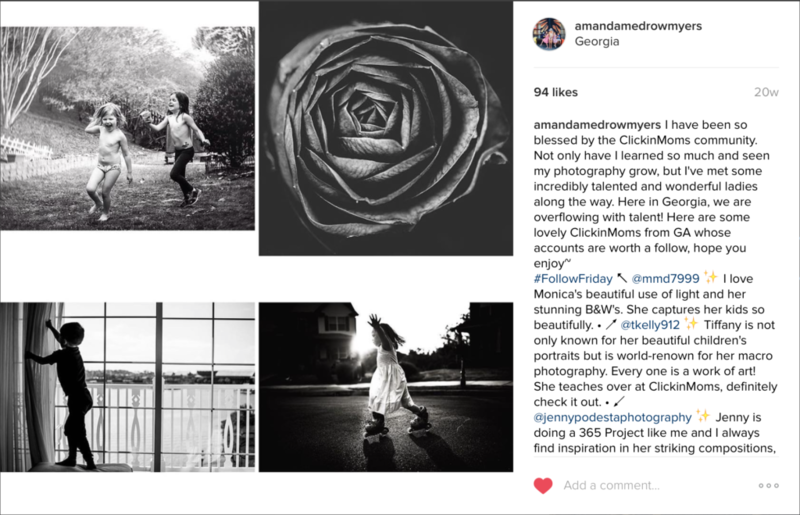 Then…I got a private message back from the original photographer….Yeah, turns out there are a LOT of us Amanda’s on Instagram. A lot. And she didn’t actually mean to send it to me. Were my feelings hurt? Yeah, I’d be lying if I said they weren’t. But big deal. I got over it. In exchange, she offered to do a FF with me the next time around. That FF was my first and I’m so lucky to have that group of ladies. It turns out that FF group continued our conversations in our group message about all sorts of things. I even mentioned a crazy business idea…And some of those ladies were my first ever HubHack members and beta-testers. Have some good Follow Friday advice? Let me know! I have what may be a dumb question. I’m about to do my first follow friday, but I can’t figure out how to copy/share/download the other photographers’ photos, in order to create my grid. On the one hand, I’m grateful that our photos appear to be protected in this fashion. But how do I proceed with my grid-making? Thank you! Hey Marie! Oh gosh, I left that out, didn’t I??? I just take a screenshot with my phone. You could download it, but why? A single screenshot will not degrade image quality to the point where anyone would notice. A screenshot of a screenshot of a screenshot, yes. But one is fine. So, go ahead and screenshot a bunch of pictures you like. Then open the Layout App (you can do this from within Instagram actually – it’s the collage-looking thing that looks almost like a boxy letter C (to me!)) Then play with different assortments of pictures, and you can even save a few of them, to look at them all and decide which looks best. I hope that helps! I finally understand this! I’ve never been asked but at least now I get it! Thanks for sharing! I’m new to instagram and I’d like to try a follow friday but I wasn’t quite sure how. I appreciate the tips! I actually might try the #followfridaymamas. I’m a teacher mom that wants to share another teacher mom account. Would that work? Is that a good hastage to use?